Washington, D.C., is finally getting a green waterfront development to be proud of. 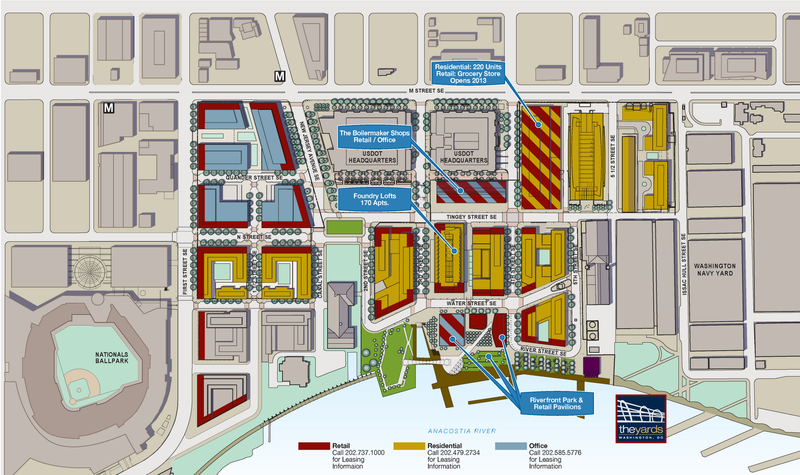 The Yards, a 42-acre redevelopment along the Anacostia River, will comprise some 1.8 million square feet of office space, 400,000 square feet of retail and cultural spaces, 2,700 rental and for‐sale homes, and a significant riverfront park and esplanade. With a great in-town location along a Metro line, a locations just a few blocks from the U.S. Capitol, and some excellent green features, the project has been certified gold under the LEED for Neighborhood Development pilot program. It’s about time. For a city with two major rivers and miles and miles of waterfront, Washington residents have surprisingly poor access to the water. Most of the land along the rivers, and the Washington Channel that parallels the Potomac for a stretch, has historically been dedicated to military uses or reserved as large federal parks (the land the Jefferson Memorial rests on, for example) far out of range of neighborhood walkability or even meaningful transit service. An exception is the land along the Potomac in Georgetown, but access there is severely compromised by the presence of the Whitehurst Freeway looming overhead along its length. That’s going to change over the next decade, though, thanks to two major projects. The Wharf will redevelop 47 acres of outdated commercial property stretched along the Channel in the city’s Southwest quadrant. The Yards redeveloping former federal industrial land in Southeast, in between the Washington Nationals’ ballpark and the Washington Navy Yard. (The Wharf - sometimes known as the Southwest Waterfront – also enrolled in the LEED-ND pilot, but has not yet been certified.) The Yards is a bit farther along, and it’s looking promising. As the site plan suggests, the project will have a bit of everything (red is retail, gold is residential, blue is offices). The Yards earned LEED-ND gold on the strength of its smart growth bona fides, including the superb, centrally located and transit-rich location; a walkable mix of jobs, housing, shops and services; brownfield remediation; adaptation of older and historic buildings; water use efficiency; and excellent street design and connectivity. The project also includes a range of green infrastructure features to manage rainwater. According to the planning and engineering firm Greening Urban, which worked on The Yards, these include a tree trench infiltration system to absorb water slowly from storm events, vertical recharge shafts that deliver runoff directly to the natural underground water table, smart irrigation and gray water systems for water recycling, and flow‐thru planter boxes that detain runoff before it enters the constructed stormwater management system. A highlight of the development already being enjoyed by the public is The Yards Park, built by Forest City Washington, master developer of The Yards, in partnership with the city and federal governments. The park includes open grassy areas, a very cool and festive waterfall and fountain area with a wading pool, a terraced lawn performance venue, recreational trails, and riverside gardens in which to eat and shop. The park’s design has won a number of awards, including a merit award from the New York chapter of The American Society of Landscape Architects, designation as best new public space by the Washington City Paper, and being voted number 16 on the list of “the top 100 public spaces in the U.S. and Canada” in an online poll sponsored by the internet planning site Planetizen with the Project for Public Spaces. The Yards Park is managed by the Capitol Riverfront Business Improvement District. The site of The Yards was formerly an annex to the Washington Navy Yard, still its immediate neighbor to the east and the Navy's longest continuously operated federal facility. Home first to shipbuilding and then to related military and waterfront industry going back to the early 19th century, the Navy Yard and Navy Yard Annex reached peak production in World War II with 26,000 employees. After the war, however, the federal facilities reduced operations and were consolidated to a smaller campus. In the mid-1990s, the military’s Base Realignment and Closure process released the by-then deteriorating industrial land in the Annex for other uses. In the early 2000s, the DC city government also launched the Anacostia Waterfront Initiative, a framework to clean up the Anacostia River, increase public access to the water, and target areas for innovative green practices in new development. (Several of my NRDC colleagues have contributed to the Initiative.) In 2004, the 42-acre site of The Yards, including several historic industrial buildings, was transferred by the federal government to Forest City Washington for redevelopment. In 2007, construction was begun on The Yards. Other early projects in the target area include Nationals Park, the country’s first LEED-certified sports stadium, which opened in 2008; and the new headquarters of the federal Department of Transportation.